1 A None No Power Seat 1 A is a standard recliner-style First Class seat located at a bulkhead. Legroom to stretch might be limited. Floor storage for personal effects is not available for use during takeoff and landing. The proximity to the galley and lavatory area might be bothersome. 1 C None No Power Seat 1 C is a standard recliner-style First Class seat located at a bulkhead. Legroom to stretch might be limited. Floor storage for personal effects is not available for use during takeoff and landing. The proximity to the galley and lavatory area might be bothersome. 1 D None No Power Seat 1 D is a standard recliner-style First Class seat located at a bulkhead. Legroom to stretch might be limited. Floor storage for personal effects is not available for use during takeoff and landing. The proximity to the galley and lavatory area might be bothersome. 1 F None No Power Seat 1 F is a standard recliner-style First Class seat located at a bulkhead. Legroom to stretch might be limited. Floor storage for personal effects is not available for use during takeoff and landing. The proximity to the galley and lavatory area might be bothersome. 10 A None No Power Seat 10 A is a standard Economy Class seat that is located in an Exit Row and has extra legroom. The seat is designated as a Main Cabin Extra seat and may be selected for an additional fee. The tray table is installed in a fix armrest, therefore, seat width is slightly reduced. Floor storage for personal effects is not available for use during takeoff and landing. The overhead storage bin above these seats is smaller than normal and a portion of it is reserved for emergency equipment storage. It has been reported that it might get very cold by the exits during flight. 10 B None No Power Seat 10 B is a standard Economy Class seat that is located in an Exit Row and has extra legroom. The seat is designated as a Main Cabin Extra seat and may be selected for an additional fee. The tray table is installed in a fix armrest, therefore, seat width is slightly reduced. Floor storage for personal effects is not available for use during takeoff and landing. The overhead storage bin above these seats is smaller than normal and a portion of it is reserved for emergency equipment storage. It has been reported that it might get very cold by the exits during flight. 10 C None No Power Seat 10 C is a standard Economy Class seat that is located in an Exit Row and has extra legroom. The seat is designated as a Main Cabin Extra seat and may be selected for an additional fee. The tray table is installed in a fix armrest, therefore, seat width is slightly reduced. Floor storage for personal effects is not available for use during takeoff and landing. The overhead storage bin above these seats is smaller than normal and a portion of it is reserved for emergency equipment storage. It has been reported that it might get very cold by the exits during flight. 10 F None No Power Seat 10 F is a standard Economy Class seat that has additional legroom. The seat is designated as a Main Cabin Extra and may be selected for an additional fee. A crew jump seat is directly in front. The tray table is installed in a fixed armrest, therefore, seat width is slightly reduced. Floor storage is not available for use during takeoff and landing. 13 A None No Power Seat 13 A is a standard Economy Class seat that has a misaligned window. 13 F None No Power Seat 13 F is a standard Economy Class seat that has a misaligned window. 14 A None No Power Seat 14 A is a standard Economy Class seat that has a misaligned window. 14 F None No Power Seat 14 F is a standard Economy Class seat that has a misaligned window. 15 A None No Power Seat 15 A is a standard Economy Class seat that has a misaligned window. 15 F None No Power Seat 15 F is a standard Economy Class seat that has a misaligned window. 2 A None No Power Seat 2 A is a standard recliner-style First Class seat. 2 C None No Power Seat 2 C is a standard recliner-style First Class seat. 2 D None No Power Seat 2 D is a standard recliner-style First Class seat. 2 F None No Power Seat 2 F is a standard recliner-style First Class seat. 20 A None No Power Seat 20 A is a standard Economy Class seat located in a last row of the section. Seat back recline might be limited due to the wall of the lavatory directly behind. The proximity to the lavatory area might be bothersome. 20 B None No Power Seat 20 B is a standard Economy Class seat located in a last row of the section. Seat back recline might be limited due to the wall of the lavatory directly behind. The proximity to the lavatory area might be bothersome. 20 C None No Power Seat 20 C is a standard Economy Class seat located in a last row of the section. Seat back recline might be limited due to the wall of the lavatory directly behind. The proximity to the lavatory area might be bothersome. 20 D None No Power Seat 20 D is a standard Economy Class seat. The proximity to the lavatory area might be bothersome. 21 D None No Power Seat 21 D is a standard Economy Class seat. Seat back recline might be limited due to the Exit Row directly behind. The proximity to the lavatory area might be bothersome. 21 E None No Power Seat 21 E is a standard Economy Class seat. Seat back recline might be limited due to the Exit Row directly behind. The proximity to the lavatory area might be bothersome. 21 F None No Power Seat 21 F is a standard Economy Class seat. Seat back recline might be limited due to the Exit Row directly behind. The proximity to the lavatory area might be bothersome. 22 B None No Power Seat 22 B is a standard Economy Class seat located in an Exit Row and has extra legroom. The seat is designated as a Main Cabin Extra seat and may be selected for an additional fee. The tray table is installed in a fixed armrest, therefore, seat width is slightly reduced. The proximity to the lavatory area might be bothersome. Floor storage for personal effects is not available for use during takeoff and landing. 22 C None No Power Seat 22 C is a standard Economy Class seat located in an Exit Row and has extra legroom. The seat is designated as a Main Cabin Extra seat and may be selected for an additional fee. The tray table is installed in a fixed armrest, therefore, seat width is slightly reduced. The proximity to the lavatory area might be bothersome. Floor storage for personal effects is not available for use during takeoff and landing. Alert! A person seated here might be bumped by other passengers passing by or waiting to use the lavatory. 22 D None No Power Seat 22 D is a standard Economy Class seat located in an Exit Row and has extra legroom. The seat is designated as a Main Cabin Extra seat and may be selected for an additional fee. The tray table is installed in a fixed armrest, therefore, seat width is slightly reduced. The proximity to the lavatory area might be bothersome. Floor storage for personal effects is not available for use during takeoff and landing. 22 E None No Power Seat 22 E is a standard Economy Class seat located in an Exit Row and has extra legroom. The seat is designated as a Main Cabin Extra seat and may be selected for an additional fee. The tray table is installed in a fixed armrest, therefore, seat width is slightly reduced. The proximity to the lavatory area might be bothersome. Floor storage for personal effects is not available for use during takeoff and landing. 23 A None No Power Seat 23 A is a standard Economy Class seat that has extra legroom due to the lack of a seat in front. The seat is designated as a Main Cabin Extra seat and may be selected for an additional fee. The tray table is installed in a fixed armrest, therefore, seat width is slightly reduced. Floor storage for personal effects is not available for use during takeoff and landing. 23 B None No Power Seat 23 B is a standard Economy Class seat. The tray table is installed the armrest, therefore, seat width is slightly reduced. 23 C None No Power Seat 23 C is a standard Economy Class seat. The tray table is installed the armrest, therefore, seat width is slightly reduced. 23 D None No Power Seat 23 D is a standard Economy Class seat. The tray table is installed the armrest, therefore, seat width is slightly reduced. 23 E None No Power Seat 23 E is a standard Economy Class seat. The tray table is installed the armrest, therefore, seat width is slightly reduced. 23 F None No Power Seat 23 F is a standard Economy Class seat that has extra legroom due to the lack of a seat in front. The seat is designated as a Main Cabin Extra seat and may be selected for an additional fee. The tray table is installed in a fixed armrest, therefore, seat width is slightly reduced. Floor storage for personal effects is not available for use during takeoff and landing. 3 A None No Power Seat 3 A is a standard recliner-style First Class seat. 3 C None No Power Seat 3 C is a standard recliner-style First Class seat. 3 D None No Power Seat 3 D is a standard recliner-style First Class seat. 3 F None No Power Seat 3 F is a standard recliner-style First Class seat. 33 C None No Power Seat 33 C is a standard Economy Class seat. The proximity to the galley and lavatory area might be bothersome. 33 D None No Power Seat 33 D is a standard Economy Class seat. The proximity to the galley and lavatory area might be bothersome. 34 A None No Power Seat 34 A is an standard Economy Class seat in the last row of the aircraft. Seat back recline might be limited due to the bulkhead behind. The proximity to the galley and lavatory might be bothersome. 34 B None No Power Seat 34 B is an standard Economy Class seat in the last row of the aircraft. Seat back recline might be limited due to the bulkhead behind. The proximity to the galley and lavatory might be bothersome. 34 C None No Power Seat 34 C is an standard Economy Class seat in the last row of the aircraft. Seat back recline might be limited due to the bulkhead behind. The proximity to the galley and lavatory might be bothersome. 34 D None No Power Seat 34 D is an standard Economy Class seat in the last row of the aircraft. Seat back recline might be limited due to the bulkhead behind. The proximity to the galley and lavatory might be bothersome. 34 E None No Power Seat 34 E is an standard Economy Class seat in the last row of the aircraft. Seat back recline might be limited due to the bulkhead behind. The proximity to the galley and lavatory might be bothersome. 34 F None No Power Seat 34 F is an standard Economy Class seat in the last row of the aircraft. Seat back recline might be limited due to the bulkhead behind. The proximity to the galley and lavatory might be bothersome. 4 A None No Power Seat 4 A is a standard First Class seat that might have limited recline due to the bulkhead behind. 4 C None No Power Seat 4 C is a standard First Class seat that might have limited recline due to the bulkhead behind. 4 D None No Power Seat 4 D is a standard First Class seat that might have limited recline due to the bulkhead behind. 4 F None No Power Seat 4 F is a standard First Class seat that might have limited recline due to the bulkhead behind. 6 F None No Power Seat 6 F is standard Economy Class seat that has limited legroom due to the presence of an entertainment equipment box located under the seat ahead. 8 A None No Power Seat 8 A is a standard Economy Class seat. Seat back recline is limited due to the exit row behind. 8 B None No Power Seat 8 B is a standard Economy Class seat. Seat back recline is limited due to the exit row behind. 8 C None No Power Seat 8 C is a standard Economy Class seat. Seat back recline is limited due to the exit row behind. 8 F None No Power Seat 8 F is a standard Economy Class seat. Seat back recline is limited due to the cabin crew jump seat located directly behind..
9 D None No Power Seat 9 D is a standard Economy Class seat located in an Exit Row that has extra legroom but limited recline. The seat is designated as a Main Cabin Extra seat and may be selected for an additional fee. There is no window at this row. The tray table is installed in a fix armrest, therefore, seat width is slightly reduced. Floor storage for personal effects is not available for use during takeoff and landing. The overhead storage bin above these seats is smaller than normal and a portion of it is reserved for emergency equipment storage. It has been reported that it might get very cold by the exits during flight. 9 E None No Power Seat 9 E is a standard Economy Class seat located in an Exit Row that has extra legroom but limited recline. The seat is designated as a Main Cabin Extra seat and may be selected for an additional fee. There is no window at this row. The tray table is installed in a fix armrest, therefore, seat width is slightly reduced. Floor storage for personal effects is not available for use during takeoff and landing. The overhead storage bin above these seats is smaller than normal and a portion of it is reserved for emergency equipment storage. It has been reported that it might get very cold by the exits during flight. Wi-Fi service is availble to all personal portable devices. Internet access is available for a fee. Daily and monthly passes may be purchased before flight. Additional information about the service may be accessed by clicking here. The American Airlines Airbus A321 (321) 187 passenger version is primarily used on US domestic routes. This aircraft features a First Class cabin with 16 recliner-style seats in a 2-2. The Main Cabin features 171 standard Economy Class-style seats arranged in a 3-3 configuration. Main Cabin Extra seats, which provide additional legroom and priority boarding privileges, may be selected for an additional fee. This seat has an insane amount of legroom and there is floor storage in front. However, recline is extremely limited. The legroom is ok, but I'm glad this flight was only an hour and some change. The window alignment for this seat is also the worst I've encountered. Always nice to have first dibs on these seats as a status AA member. The jumpseat in front of 10F is actually facing backwards, unlike the seat map. Enough leg room for even the tallest person, though you have to store your bag in the overhead bin. Pretty disappointing seat. Plane is old and has no power outlet or entertainment system. I can do without entertainment on a 4.5 hr flight, but no power outlet or USB???? Cmon. Also, leg room is quite limited for First Class. Next time Ill save the money and sit in an exit row in Coach. This is one of the best economy seats on any domestic airline. There is no seat in front of you, so you have about 8 feet of legroom, and there's room to store your personal item under the seat 2 rows in front of you. There's a small upgrade fee, but less than to upgrade to MCE. On the whole the A321 is one of the nicer and more up-to-date planes in the AA fleet, but AA's economy product still lags behind Delta and JetBlue with no power ports and far more limited in-flight entertainment. This version of the 321 is the "newer" plane verses the one they fly LAX-CLT which is thier 1980's version. Seat is showing it's wear and tear. Bulk Head seat has very little leg room so this row should show in red. FA did bare minimum on what should be a signature flight. Food was tasty but very limited. I would recommend Hawaiian Air if going to the islands as they do a much better job on the routes. Giant electronics box here for non-existent seatback IFE. Flew this plane from CLT to LAX. This plane is missing IFE (Inflight Entertainment) and even bringing your own tablet you have to either download the IFE app or have the AA app on your phone or tablet to access the plane's entertainment. Download you're entertainment beforehand or bring a big book. This seat is your typical economy seat, uncomfortable, small, and cramped beyond belief. The flight crew were good, gave me a couple of free cocktails due to taking so long to serve drinks and snacks. Apologized for the wait and service which was nice. My best suggestion is to download the AA app on your phone or tablet. It gives you up to date information on everything from flight status, boarding pass, and checked luggage status. The width on this seat has to be 14-15 inches ... it is incredibly tight. They shrunk the seats down to make sure the exit door opens. Supposedly, this is a Main Cabin Extra seat. Even though I'm Premium on AA and get Main Cabin Extra for free, I can't imagine if I had paid for this seat. When attendant offered for anyone to move out of the exit row, I almost took the offer. In all seriousness, it could be the worst seat I've ever been in. I think a middle seat at the back of the plane would be better. Throw in no power anywhere. It ranks up there with worst flight ever. Glad it was a 1.5 hour flight. Some of the reviews tell real tales of torture. No more A321 for me. Seat 23A is NOT a Main Cabin Extra (MCE) seat. While it has extra leg room due to no seat directly in front of it, AA markets and sells the seat as a Preferred Seat. The cost for the MCE seat in the exit row in front of me was $71. Seat 23A cost was only $31. The same applies to seat 23F across the aisle. Seat does have storage under the seat in front of you (way in front of you). It is nice and ope to the right for people with broad shoulders. I was in 31F on an American Airlines flight to Philly from Tampa and this seat is a perfect window seat. This was an extremely disappointing First Class. SO not worth the money. 1. The seat pitch is very tight. When the people in front of me reclined their seat backs, I literally had to climb over my neighbor's seat to get out. Quite awkward. 2. 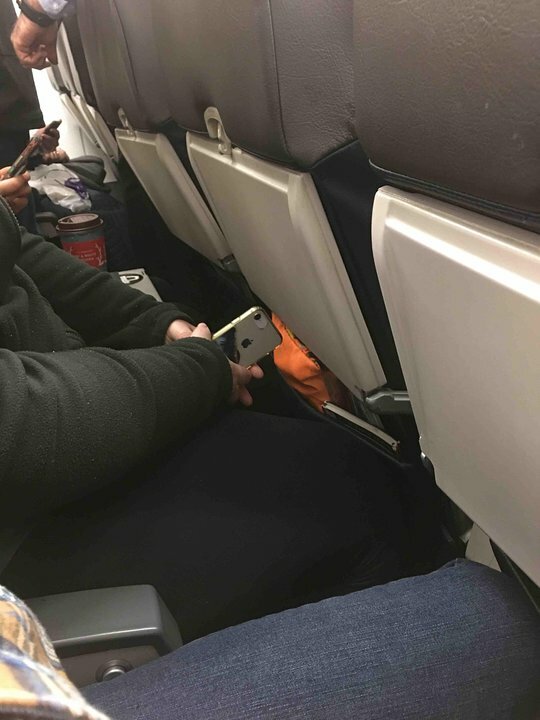 There is no seat-back video, so you have to use your own device. I could never get mine to work, so no entertainment for me on this 5+ hour flight. 3. There is no power. So you're stuck with your own device for entertainment, but likely run out of juice mid-way through. 4. The food is barely so-so. A cup of mixed nuts, some chicken meatball thing that was ok, and then a packaged cookie for dessert. There was NO RECLINE and the seatback is close to vertical. It is the worst seat I have ever sat in on a flight. Plus it was a redeye flight which made it all the worse. I can always sleep on a flight but not this one and I paid EXTRA for that seat! This is a domestic first-class seat with one window at the knee. Due to constant friction from the jetway hood, the widow was very hazy from an abundance of scratches to the outside surface. if you want a window to see through, do not choose 1A. The seat was quite comfortable for the long haul from CLT to SFO. It would have been more comfortable if there was a leg or footrest that comes out when you recline the seat. The recline is not much, pretty comparable to economy. The bulkhead seat gives you just a slightly lesser amount of leg room than a standard first-class seat. The seat is wide and has a foldable headrest to keep your head in place should you wish to sit back and relax/sleep. Food service was mediocre; lasagne that was warm in some parts lukewarm in others. Dessert was a handmade sundae. FAs were very attentive and professional with their service. Very disappointed AA does not offer IFE, power, or free wifi to first-class seats. This is a domestic first-class seat with one window at the shoulder and one at the feet. The seat was quite comfortable for the short hop from BWI to CLT. It would have been more comfortable if there was a leg or footrest that comes out when you recline the seat. The recline is not much, pretty comparable to economy. Plenty of legroom and the seat is wide and has a foldable headrest to keep your head in place should you wish to sit back and relax/sleep. No food service on this short hop, but FAs were very attentive and professional with their service. Very disappointed that AA does not have IFE, power, or complimentary wifi for first-class seats. Seat 7A is a standard economy seat with one window at the shoulders and one at the knees. I am not tall so I had no issues with legroom, seat width, or seat height. This particular aircraft, N183UW, was an older plane with an older interior and was just a little bit uncomfortable at the end of the flight from PHX to DCA. There was no IFE or power on at this seat. Seat 6A is a standard economy seat with a window behind the shoulders and one at the knees. I am not tall so I had no trouble with leg room, the width of the seat, or height of the seat. For the short trip to PHX it was comfortable. There was no IFE and no power at this seat. This particular aircraft, N545UW had a newer interior with nicely finished seats. The seat width is "slightly narrowed." I'm a 5'4" female weighing 134 pounds and I found this seat very tight. The "window" is a 4" diameter window in the exit door, worthless. I paid extra for this seat and was very disappointed. The legroom was good, but that was the only good feature of this seat. Faced with a 5.5 hour flight on this aircraft,I chose this bulkhead seat for my 6'2" body. Seat didn't recline and was uncomfortable after a few hours. No power in seat which is unacceptable in today's world especially given that IFE is via your personal device(s). Bulkhead wall was not open at the bottom which limited foot room. Very disappointing. This is a very roomy seat in the exit row. Theres room for a small bag in front of you (although not very close). No USB port. I choose this seat often. This seat was a HORRIBLE waste of money. $86 for "Main Cabin EXTRA" was terrible. You are right next to the door so it is freezing, also the flight attendant's jump-seat is right in front of you so she will be going in and out over your legs. There IS extra legroom, but that's it. 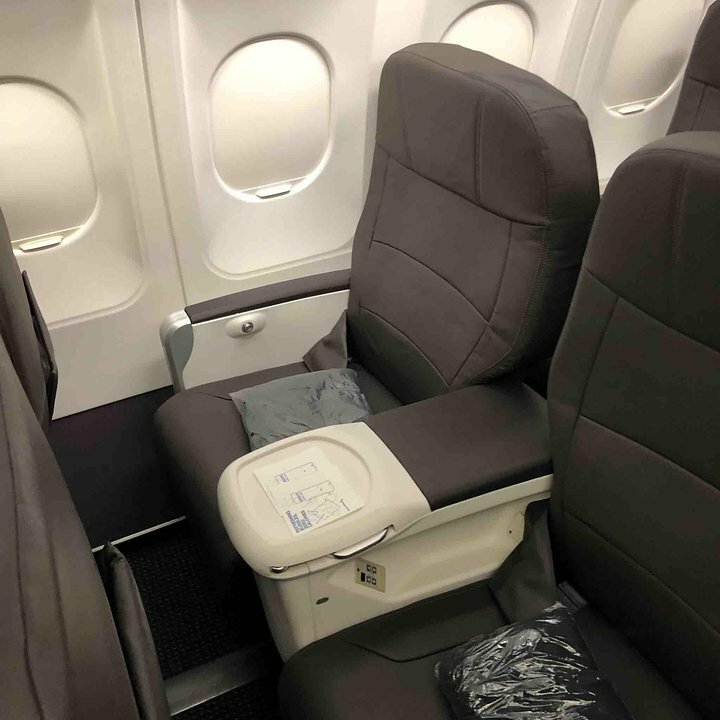 The seat not only is smaller because the traytable is in the solid armrest, but it is actually a physically smaller seat width-wise than the seat directly behind it, and it is less cushiony owing to what seems like a pared down shape to squeeze the two seats and the jump seat into the bulkhead area. My husband sat in the aisle 22C and was run into constantly by passerbys. Also bring an eye mask because as a red-eye, they shut the lights off for sleeping but the bathroom is right in front of you and every time that door opens its bright light. There is NO entertainment or power plugs on this plane. Also no place to store things except overhead bins for these seats. All in all, a giant waste of money, should have chosen one row back. Seat did recline some. Agree with most comments here, almost 6h is a long time without IFE and lack of power for personal devices. The bulkhead in front of row 5 is curved, but still does not leave enough room to stretch legs. Not sure if it´s worth to be considered as MCE option. Flew LAX=>CLT on 21 March 2018 in AA's so-called "first class" seat 3D on an A321. What a disappointment - the interior is stripped-down no video or power ports anywhere on the plane, and GoGo in-flight wireless mostly non-functional. Next time if I have to go on AA, I'll try to make it on another aircraft or go on Delta. 23F does have underseat storage. You put your stuff under 21F. It's a bit difficult to access during the flight, but if you're going to 35 inches of legroom, you have to reach 35 inches forward to get your things! 23A doesn't have storage because the crew jump seat is in front. There is a box under row 11 seats that limit leg room for row 12 seats. You should not pay the extra money for these seats. This flight is a nightmare in general, on very old equipment -- NO power ports, no entertainment even though the armrests have nonfunctional buttons and jack for audio. Seat space in coach is the tightly-packed misery we've come to expect from AA, but seat 7A adds a new low in foot space. I don't know why we need those equipment boxes on the floor if not for entertainment (or what plane-mechanics could possibly require above-floor interior boxes?). However, I measured how much of the footspace in front of seat 7A (under 6A's seat) was taken up by such a box and it was approx. 8". I could barely fit a soft-sided tote under there, and even if I hadn't had that, it wouldn't have given me much more foot room. Someone tall would have been miserable in that seat, or at least more miserable than in the others (including the tall guy in front of us who insisted on full recline for the entire flight. I nominate 7A for lousy-seat status. Foot space only roughly 9" wide hardly qualifies for a handbag, let alone feet in normal shoes. There are extinguishers plus the FAs put their luggage in the overhead bin that should be for your stuff so you DO NOT have a place for your carry on close to you if you're not one of the 1st 3 people on the plane. Across the aisle had their bin to use, but not our side. And they WILL make you put the carry on up. No entertainment, no plugs. Glad I hadn't paid full price for the seat and sorry I had wasted mileage. I hate Airbus and will not fly on one again. While seats 12A and 12F have no seat in front (as Row 11 has B-C-D & E only), seat 12F faces a jump seat used by the crew during taxi, takeoff and landing. That means there is ZERO underseat storage and all items have to be placed in the seat pocket or overhead bins. As noted by others, the TV monitor is in the armrest, making it a bit tighter than others but the biggest issue is no underseat storage. This seat was showing on the map as reclining yet the button to do so was missing. The only seat in the entire row 8 that reclined was 8D. Seats A,B and C had a hard partition directly behind them. All exit row 9-10 seats are fantastic if you value legroom and aisle access above all else. I'm 6', 175 lbs with longer than average legs; I book these seats as early as possible. This row has no in-flight entertainment system, so carry your own tablet/phone/etc. I've taken 5 hour flights in this seat and it's easily my favorite in the cabin. Great leg room, can store small items under your seat if person behind you doesnt have anything. But the comments about being able to store items under seat 8F are a bit misleading - you can do that but bc of the jumpseat blocking, you have to twist and bend to get to your items. And the FA had his/her bag stored there so even though I could fit my bag further in with the FAs, having to move the FAs bag each time would be a pain. Youre better off storing any personal items in the overhead if sitting in this seat. Great access in/out of the seat though! Not too narrow a seat but then I am 55 and 110lbs (so fine for me)! Standard seat with full underseat storage in front of you (no boxes or equipment or bags partially blocking the underseat storage like oftentimes there is). Seat 24D is standard economy. Nothing great, a little tight in leg room for me. I am 6'4" and had a tall passenger in 23D who leaned the seat back into my knees the whole trip. See photos. Seat does not recline at all. When the seat in front is reclined working on a medium-sized laptop is difficult. The seat does not recline at all and because of it being right in front of the lavatories, one can hear, loud and clear, everytime someone flushes. Perhaps it should be red. I'm surprised these seats are considered first class. The seat was lumpy and extremely uncomfortable. The crew was great - they saw to it that passengers in first class were taken care of. Will not fly American "first class" again. Best seat in aircraft. I'm 6-5. This is my go to seat. No seat in front of you. 23A and 23F are comparable. This seat can get a little cold as its by the door. I fly every week from CLT to NYC. Great for a one hour flight. AA renewed the interior of these planes. No power or seat back entertainment but not uncomfortable for an hour or two in my opinion. I'm 6'5" so leg room is of the upmost importance to me and outside of 1st class, this seat is my go-to anytime I fly and AA A321. Sat in 2C on a flight from LAX to CLT. The seat has no power, no IFE, no lumbar support at all, and minimal recline. American should be embarrassed to sell this awful product as First Class. Just lousy. Definitely taking Delta to ATL from now on. This seat does in fact recline. Maybe less than normal seats but it does recline. 10D and 10E should be colored yellow as they are limited in width with the tray built into the armrests. Never fly on this plane in first class. There is no power and no entertainment system. You can bring your own device but if it runs out of power - say for your child's ipad - you are out of luck. Better yet never fly AA if you can help it. Decreased leg room due to box under seat in front. CLT-LAX. I was thinking this plane & the interior might look really old since it's an ex-US Airways plane. However, the interior was renovated & looked relatively modern. The seat width & legroom were great for a 4.5 hour flight (I'm 5'9"), much more spacious than on the 737. Not having entertainment systems wasn't too bad, just bring your own stuff & make sure your devices are charged, as there are no outlets on this plane. Overall, would travel on this plane/seat again. This seat is billed as an exit row seat but the leg room is no different than the other seats. Row 22 is the true exit row. Bathroom proximity is bothersome and noisy. No window. Seats are narrower due to yray tables in the armrests. Bottom line, It's not worth the extra fee. Lots of love for 10A on the a321. Im 6'1" and have room to roam! I boarded the aircraft for a 0600 Departure from LAX to CLT. The seat was wide, comfortable and reclined nicely. I'm used to making international flights and was a little disappointed that this aircraft was not yet equipped with inflight entertainment or AC Power or Wi-Fi but for the five hour flight I slept most of the way. This is only because the aircraft has not gone through the upgrade process yet and this takes time. The breakfast was surprisingly delicious and Flight Attendant was cordial. Overall the trip was good and I would do this again. Recline is definitely limited on this side of the row due to the partition separating the 'Main Cabin Extra' seating from Economy seating, although i believe this has not always been the case on other versions of this aircraft that I've flown. I just want to say that the seat was fine. However, passengers should really complain to flight attendants if their seats are less than satisfactory. They will then report it to Captain which will write it up and give it to the mechanics. And it will be fixed. Great seat. No pocket for stuff. Yes it reclines. I flew on this plane from New York to LA.The seats were comfy but pretty old, and a bit worn. I was surprised to find that there was no tv screen, which was a bit disappointing, since I have paid 650$ extra, so that I could have some time to relax. At least the plane had wifi which was good, since I could use my phone to watch a movie during the flight. Food was OK, but nothing special. Crew was very polite, and the plane was clean overall. So-so flight. Not the greatest seat. My plane was an older plane, retrofitted. The legroom was fine. The window being misaligned was a bit annoying but else okay unless you want to stare out the window all the time. This seat needs to be replaced as soon as possible. The seat does not recline and it move when the middle seat is slightly moved. The worst experience I have ever had on a flight. If you have ANY additional padding in the hip area, AVOID this seat at all costs. With tray tables to the right and left of you, there is absolutely no give. My hips were so painful, and it was also affecting my knees. Grateful that another passenger was willing to switch with me. I will consult SeatGuru from now on for ANY seat selections! My impression of flying First Class with AA on the Boeing 321 was of paying twice as much for a little larger jail cell. No IFE, wi-fi for a crazy fee, but never mind, there are no charging ports, so really worthless anyway.The seats as least reclined more than 2-3 inches, as in the other 3 legs of the flights I booked first class. Never again on AA. Southwest was a better on business class, COPA first class had better meals, and guess what - TV screens, inflight entertainment, headphones! Never again on AA first class, I'd rather fly connecting flights on modern airlines, even if it means connecting cities. The FA's worked very hard to overcome your shortcomings, and apologized for the lack of amenities on the first class side of things. Decent seat for view, a nap and carryon under seat in front of me. No built-in entertainment. Free streaming of AA content to personal devices, but no power, so make sure your phone or tablet is fully-charged. Very narrow and highly uncomfortable despite a missing row's worth of legroom...unless you have super-slim hips and no shoulders, avoid if at all possible. This was a 2005 vintage A321 that was the most uncomfortable plane I have ever been on. No in seat amenities for the 4+ hour flight. Glad my PC and iPad and Phone were fully charged before the flight. Make sure yours are too or catch a nap if you can while sitting on a bed of nails. Service was great but that is the only positive thing I can say about the flight. So much hate for this plane... Sure, it's older and a bit shabby. Then again, I had one of the only 2 "green" seats. 23F has no seat in front of it, so loads of legroom. Underseat storage under 21F. The row DOES recline. Even with the armrest/tray the seat felt wider than similar Boeing seats. Maybe it isn't, but felt like it, but then, I'm just "American-sized," not super-fat. I had this on a 4hr DFW-SFO flight and was comfortable enough to sleep the whole way. This seat and the entire row 5 has excellent leg room. The lower part of the bulkhead shifts forward to allow excellent leg room. 1D from ORD to PHL. Good width and better than expected legroom for a bulkhead seat. Wouldn't hesitate to book into a bulkhead seat on this aircraft type in the future. The seats are pretty new, however, the seat reclined minimally. Maybe about 5 degrees at most. Barely moved. Seems many of the other seats were the same. The headrest did not move nor had those side wings that can hold your head while you sleep. The seat had no electronics (no radio/no tv). For a 5 hour red-eye flight this was a nightmare. Could not sleep. Could not recline. Could not watch any tv nor listen to any music other than what I already have on my phone. Horrible. Avoid like the plague for red-eyes. The space was fine. I am 6' 0" and I had sufficient space. This interior is badly in need of a refresh: visibly worn (e.g., bent tray table), no power, no screen, and the seat is not comfortable. The last row has a limited recline. American can do better than this. The leg room is actually quite spacious in this seat. The major downside is that the seat does not recline because the recline button is broken and has been removed. Why does a plane lacking all entertainment (not even an earphone jack and old music) need "entertainment equipment" that takes up underseat space? This plane is SO OLD that the windows rattle on landing. Way past it's expiration date. Great legroom. Narrower seat than normal because of the tray table in the armrest. Because of the proximity to first class and the economy bulkhead overhead baggage can be a challenge (there is also emergency equipment in the overhead over the DEF side of the aircraft). This can be further compounded by some aircraft having a sold bulkhead which prevents putting a smaller bag under the seat in front of you. That said the pros far outweigh the cons. Great seat with a lot of leg room! Seats were completely worn out and nasty looking. On top of that the plane was dirty too. This was by far the best seat in Economy. unlimited leg room, close to the lavatory but not too close. Was very comfortable on the 5 hour flight to LA. Great seat. Six feet of leg room. Flight attendant sits facing you for all of 10 minutes for take off/landing. If you want more behind in your face than the nation's leading proctologist, or a free lapdance by a 300lb passenger, then this is your seat. Because of the aisle location kitty corner behind the bathroom and the wide leg room that I paid $69 for, every person who was in line for the can decided they'd just cozy in with me in my legroom space and put their behinds in my face while waiting their turn. And a few who were stuck in the aisle used my overhead to steady themselves, with arms upraised and bellies hanging out, without apparent recent bathing or use of deoderant. Horrible choice of seats. However, it does discourage you to use the head after you've seen the clowns that line up to use it. I'd rather hold it for the 5 hour flight. Seat has restricted legroom and floor storage due to the livesaver compartment of seat 5A That reduces floor storage width. Plane does not has entrainment serices such as tv. This seat was way too close to the lavatory. Expect the light to be super bright and go off every 5 seconds when someone goes in or out of the restroom. Just paid $32 for a seat on my next flight, since this was the only other aisle seat available. Flew the LAX-CLT route. Seat 10A,B,C are great seats, exit row with no seat in front, plenty of leg room. 10B has an emergency box blocking the underseat storage, doesnt affect leg room. 9E, D are great seats also, no row in front of them, there is a crew member jump seat next to 9D but it doesnt interferre. These are all exit rows so arm rests are fixed with tray table fold out, slightly restricts width. First class seats barely recline - not worth paying for on a redeye. Despite the fact that the seat was actually wider and with better pitch than the 787-9 I transferred from in DFW, this seat ended up being sooo uncomfortable. Saggy bottom, no lower back support. This is a tired old ex-USAirways jet that they inherited. The new logo is literally glued on top of the old USAir logo on the bulkheads. Dirty and sparse, this is not an aircraft a modern North American carrier should be flying anymore. Will avoid in future. I am 6'2" 250lbs so need to take first class on many carriers, so I have been a platinum exec elite status with AA for many years, but no more! 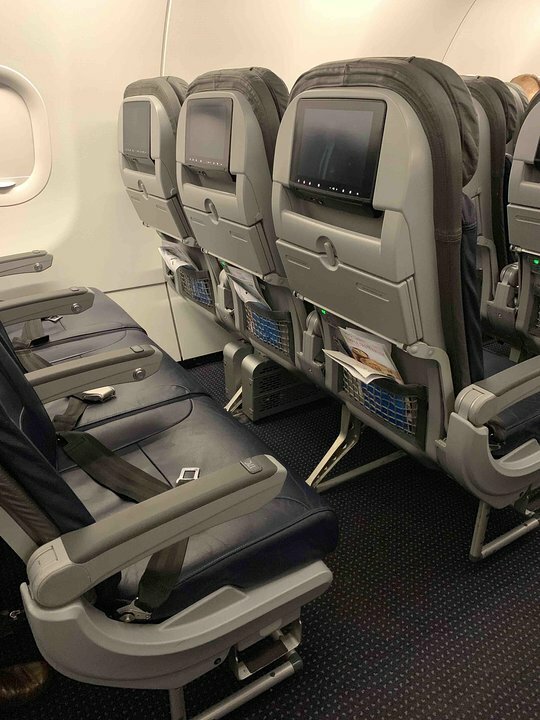 These AA LAS-MIA red-eye flights had the most miserable first-class seating imaginable. AA did the usual bait-and-switch with equipment; what was supposed to be a AA32B V1 with lie-flat seats, was replaced by this US Airways torture chamber. Seats were hard, back-breaking nightmares. No power outlets, no conveniences expected of a 5-hour first-class flight. I once had to fly LAS-MIA on Frontier Air and found their hard-plastic seats, at one fifth the price, were more comfortable than the AA 321 V3 first class. This seat and 15C on an A321 has more leg room since there is no IFE unit. This plane not the MD-80 is the true flying fossil. TAKE CAUTION- CHOOSE OTHER PLANE AT ALL COSTS. No IFE, radio, or power. SOOO BAD. Curse you US Airways for this plane that is now flying for American. Although the window was misaligned, I could still see through it by leaning a bit forward. I was very surprised when I boarded this former US Airways bird, it was fitted with the new American seat cover instead of the old blue seat covers. I could tell they were the same seats because they still had the same padding and comfort as the ones from older US Airways aircraft. It smelled like new and it was nice to see that American is making an effort to fit this older birds with the new seat covers. No seatback IFE, however, it was available at no cost in laptops and other electronic devices (which I think it's way better, it gives it a more personal touch). Overall, excellent flight! Just flew PHX-DFW. Seat was fine for the 2 hour flight. No IFE or wi-fi for this flight. The 6F window did not appear to be mis-aligned. This is a horrible seat. Behind a reclining exit row with no space and there is a box or something in the foot area. So you cannot place a carry on under the seat and there is space on for you left foot to extend as the right side is the with the box. The first class cabin on the plane conforms with my findings on virtually every US Air configured plane - passenger comfort is not the main priority. The seat width is fine however, the distance between the seats is narrow, especially if the seatback in front of you is reclined. Seat is also hard and after an about an hour, my back and bottom was complaining. Standard seat, with tremendous legroom. Although it's stated on this site that there is no storage under the seat in front of you, that is somewhat untrue. There is no F seat in row 9, however you can place your bag under seat 8F. Overall, great seat. Awesome legroom. Horrible seat! no recline. Extremely limited leg space. My laptop is hanging on to my lap as it did not fit the tray. Truly Cattle carrier. If this is the future of American air carrier's seat map, I should hang my traveling boots. Seat does not recline... possibly broken. Crew seemed to know it did not recline. Very very poor seat cushioning and reclining for a 1st class seat. First class seats were poorly padded and very uncomfortable. I had to fold the provided blanket and use it for additional seat padding. 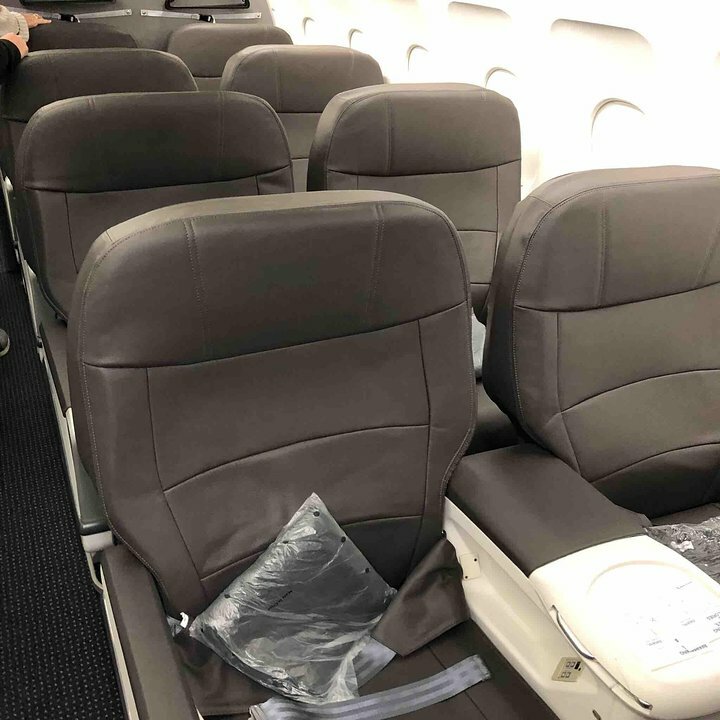 I've never flown on an aircraft this uncomfortable, and I'll certainly remember American's "new and improved" seats the next time I book a flight. The tail registration on my flight indicated that this aircraft was only 18 months old. Despite being new, the seats were unbearably uncomfortable. This is the first flight where I've seen the aisles nearly full of passengers for most of the flight. Only a short flight from LAS-CLT , but a great seat for it. endless legroom, and unlike the main note for this seat it does have unseat storage under 8A, 10C has the same under 8C, but 10B doesn't, its blocked by a box behind 8B. Good view in front of the wing to watch America pass by beneath. Seat 5A is a bulkhead seat. Unlike some of the newer planes, the partition when all the way to the floor, so there was no room to put a personal item under the first class seat in front of you. There was a little more legroom that the traditional seat, though. Overall, it was fairly comfortable. My flight from Charlotte to Orlando did have wi-fi. Wow, when they say narrow, they mean NARROW, this is the narrowest seat I've ever sat in, and I've flown spirit. If you're over 200, seriously consider looking elsewhere. The seat in front reclined so far back, I had less than a foot of room between me and the seat. Also, the seat's entertainment screen would cut in and out and had very grainy video. Awful seats. Have never been more uncomfortable for a red eye flight. Didn't sleep at all. Barely recline. What's worse, paid extra! American has also lost their attention to detail. Used to fly them years ago. Thought I'd try them again. Very dissaponting. The seat is very tight, so if your a little over weight you will be more comfortable is another option. The left armrest for seat 22B did move up, so I was able to raise it and turn so my legs were towards the exit door. For 22C, the armrests do not move, and you get the additional bumps from people boarding and also waiting for the restroom. I flew This Plane from SFO to both PHX and CLT. For the 1.5Hr Flight to Phoenix, the fact that there is no IFE is fine because the flight is relatively short. But when Flying on a 5hr flight Transcon with NO IFE? I dont Think So! And Of course, on my return from CLT, the flight was DELAYED NOT 1, Not 2, Not 3, But 4 HOURS! What is wrong WIth American Airlines. They really need to upgrade these AGING A321 aircraft from US Airways to the new Config with IFE and power. 22C should be rated a BAD seat. As the comments say, it is far narrower than the standard seats on the plane, it doesn't recline, the armrest doesn't move, there is no floor storage, AND the overhead compartments are small because they contain equipment. The supposedly redeeming quality is that it has extra legroom because it's an exit row seat, BUT the legroom is in front of the door to the lavatory, so if you stretch out your legs, people going to the lav trip over your feet. So it's difficult to take advantage of the extra legroom. Probably the worst seat I've ever had on an airplane. The strange airbags attached to the seat belt is very uncomfortable and further confines the already smaller seat with due to the tray in the arm rest. Armrest is not movable on this aircraft. I have TWO tray tables. One on the back of seat 22C, and one in the armrest. I was a little disappointed for my first flight in a first class seat. It was a red-eye flight, which is why I cashed in some miles to try out first class, hoping to get a better experience than coach. While the seats are definitely wider and there's more legroom that coach, the seat didn't seem to be that much more comfortable. Recline? Not more than a couple of inches. No power, no in-flight entertainment, either. I guess I was looking for a little more comfort in first class. Seat Legroom: Outstanding legroom as there is no seat in front of you. Seat Recline: Perhaps the seat I got was faulty, but there was minimal recline Seat Width: Narrower than the standard seat because the seat tray is built into the armrest. Both armrests are immovable. There is one window that is positioned just a bit forward of the shoulders when sitting back in the seat. There is an emergency exit door in-line with row 22, but row 23 is not cold on your feet. Things to be aware of: if you are flying on a red-eye, the bathroom in that area is bothersome, not because of the noise, but because when the door opens the light shines right down on row 22DE and 23DEF. I found it to be an annoyance, and would probable choose 23A next time I have the option. This was a US Airways aircraft but, it was still comfortable. Flight crew was very nice and the recline was pretty good for economy class. The window is not misaligned. I say grab this seat if you can. Five stars out of five stars. This preferred seat has a box of some sort on the left side so a medium backpack or laptop bag will not fit there and you will have to put it in the overhead storage. Additionally, you cannot fully stretch out sue to the placement of the box. It is MUCH more intrusive than the boxes on the latest 321B or next gen 737-800's so avoid this seat if you can help it. Luckily, with elite status I didn't have to pay for this seat but would have far more dissappinted if i had. Very restricted leg room on all seats the the entertainment box under the seat in front of you. Flew this trans-continental flight from CLT to SEA. This is a former US Airways aircraft not yet upgraded. Nonethless, seat was comfortable for the 4h45min flight, good pitch by modern standards, no soreness in the rear-end, unlike some of the newer "slim" seats found on upgraded hard product. Yes, it lacks modern entertainment features like IFE or power, but the comfort is more important for a longer flight. All A321 V3s in American's fleet are ex-US Airways aircraft, so they are not updated like the 321Bs. Nonetheless, the seat was still comfortable and had plenty of legroom. The lavatory in the middle of the aircraft helps reduce the number of passengers standing in the aisle toward the rear. No seatback IFE or power ports though. BE WARNED: Even though American Airlines will tell you seats 10D and 10E are exit row seats on this aircraft they are only regular economy seats with no extra legroom. Plane seemed brand new, seat comfortable and plenty of space in overhead bins. Tray table was solid, with no signs of drooping like you get on older planes. I've seen SeatGuru comments for other planes which say the exit or bulkhead seats are narrower, when the only difference is that the in-armrest tray tables mean you lose the inch of space under the armrest in other rows. That's not the case here - all 4 seats in row 22 really are narrower than the rows behind them. Plus you lose the under-armrest space. It's mitigated a bit by the fact that the missing window seat means both passengers can lean away from each other, but this is definitely a seat for skinnier folks. Or tall ones, the legroom is great. The Seatguru comments are correct that 22 B/C have no underseat storage, but they are wrong when they say the same for 22 D/E. Those seats have no bulkhead (but still have ample legroom), and can store bags under the row 21 seats. For that reason, if I were choosing row 22, I would prefer the D or E seat. Great legroom, seat leaned back nicely. Not the most comfortable seat though. I disagree with the unfavorable comments about this plane. I flew recently from DFW-LAS and found the seat comfortable with plenty of legroom and I'm 6'4". On a later return flight was seated in 31A and it was fine too. AA is copying Spirit tho and charge for Wifi, bags etc. May 2016 - This is First Class? When was the last time you didn't have a power outlet in First Class? Or a seat that BARELY reclined (about 1")? Or only 34" of legroom (same as coach on Jet Blue). Hopefully AA reconfigures these ex-US Air dinosaurs. Until then, just be aware...this is not First Class or even close to it. this seat is sold as an extra value due to extended let room... it has lots of leg room but the seat itself is very uncomfortable. It has fixed sides and does not recline but the worst think is the seat width. I had a tape measure wit h me and it is only 16 3/8 inched wide. I remember when the Florida Gators reduced the space allowed to seat spots in their stadium from 19 inches to 15 to increase the capacity of the stadium, well at least there you could hope for a no-shown or a couple of skinnies. but on this plane there is no home you will need a shoe horn to get in (unless you are Barney Fifth) I is upsetting that American considers this an extra value seat when it is rally the punishment row... and they charge extra. This seat cost $65 extra and it made the flight bearable, but it's the most uncomfortable plane I've ever flown. No padding in seat, actually painful. Seats 10D and E are sold as exit row seats but 9D and E were right on top of them and make the term exit row a bad joke. I have never been this uncomfortable on Delta and will definitely be avoiding American's A321 after this! This seat was not in the Main Cabin Extra as indicated when booking the tickets. I was glad there was noone in the middle seat or it would have been a misreable flight. The person assigned the middle found another seat, as i am a big guy. The seat belts were also smaller than a Boeing, but just enough to not need a extension. The leg room was barely adequate. If the flight was longer than 1 1/2 hours I would have been very upset. How do people hate this plane, flew PHX to MCO, thought it was a great flight. Had 2 windows, sure it did not have any tv's but still it was a great flight. Definetly better than Delta Airlines. This plane is awful. Total USAIR stock, with sub-AA-standard flight crew, and packed to the gills. Seat 22D is excellent if you need extra leg room, have the body width of a small, starved child, want 5 hours of non-stop odor, and want to be constantly trampled by the 187 people fighting to use the lav. Seriously. The only good thing about this seat at all is the leg room. The rest...horrible. Partition wall behind row 8 on the A-C side so no underseat storage for 10A-C, first aid box blocking 9E underseat storage and jumpseat in fron of 10F. 9D appears to have underseat storage space but the passenger isnt using it and might be restricted due to the door of the first aid box. This is the worst possible plane for a cross-country flight. It reminds me of the old M80s in its bare-bones structure and amenities. The seats, even in first class, barely recline, and I swear there is less leg room than I'm used to in first class (other than M80s)because I haven't grown or gained a pound and my seat mate--a normal-sized woman--had to get up to let me out since there was not even six inches between our knees and the seat in front of us. There is no entertainment for a six-hour flight, though one can connect to AA's on board WiFi to download AA's selection of movies on their own devices that support it. So, bring your laptop, iPad, iPhone or Android (though who wants to watch a movie on a phone?) if you want any in-flight entertainment.My Kindle Fire couldn't support it, and my Android screen was just too small to enjoy it. The tray table does not extend fully to the armrest, meaning it is not level for doing work. Also it extends just enough to the arm rest to rest on it and then snap down when you put an arm or computer on it. Very annoying. Very little recline on any of the first class seats. No place to put your handbags as this is the front row. No TV screen, no foot-rest. Hardly what you would expect for a cross-country first-class seat. Very little recline on this seat as the coats are hung behind it. No TV screen, no foot-rest. Hardly what you would expect for a cross-country first-class seat. Really a bare-bones First Class. No enertainment screen, no power outlet, limited recline seat. I was very surprised. And the charge for wifi access was outrageous. They offered streaming service for some grade-B movies, at a cost of $5.99! And if you device needs charging, tough luck -- no power outlet. Great legroom in 23F. You can store a small bag under 21F, but you can't reach it while seated. It takes a while to deplane since you are in back, but if you want to stretch out your legs, and have no one relining into your space, it is a good choice. Terrible seat for First Class, same for the remaining 15 seats. Hard, minimum recline for First Class, no entertainment at all, no electrical outlets, no pillows considering we were flying overnight from LAX to CLT. The 32Bs we flew from KOA-LAX was excellent in every way in comparison. Typical middle seat. A little bit of room to cross my legs (I'm 6'3") so that was nice. This aircraft has no power or entertainment systems on board. Decent legroom even with the jerk in 5c reclined. This aircraft has no power or entertainment onboard. Not what I would expect these days on a four hour fight from CLT to LAX. LAX-HNL I've been flying in first class with American for 25 year or so. I've watched first class gradually decline in terms of seats and service. The seat was really uncomfortable, I had to put the pillow behind my lower back for some lunar support, and the bottom of the seat is very hard. The crew was almost surly, certainly not welcoming or accommodating. While you still have more leg room and you get served a mediocre meal, this is one of the worst first class seats I've flown in. Absolutely the worst first class seat and service we've ever experienced. Prior to boarding had just flown over 11,000 miles with AA and partner HA--All other bus/first were EXCELLENT..NO service and no COFFEE prior to landing in CLT @ 8AM..---This is most disappointing AA flight EVER!!! Flew ATL to LAX over thanksgiving. This was, hands-down, the most uncomfortable flight I can remember. No in-flight entertainment as many of the seat-back screens did not work. Nearly impossible to retrieve anything that fell on the floor or get to a bag stored under seat in front because the seat in front of you is so close. I will take this aircraft model into account before booking another flight on American. Flew on Dec/22/15. It was a 5 hour long flight. No seat recline at all. Not even a full inch. No onboard entertainment at all. Not even audio. This aircraft is being widely used by AA on Phoenix routes, long and short ones (which I took on the same night on a first class 'as bad' seat. I advise caution before booking on advertised A321s. Absurdly uncomfortable. Literally almost no seat recline at all. No entertainment either. Too unbearable for flights over 3 hours long. Absurdly unconfortable. No recline at all. No kind of entertainment as advertised and displayed on SeatGuru. Too umberable for a flight longer than 3 hours. 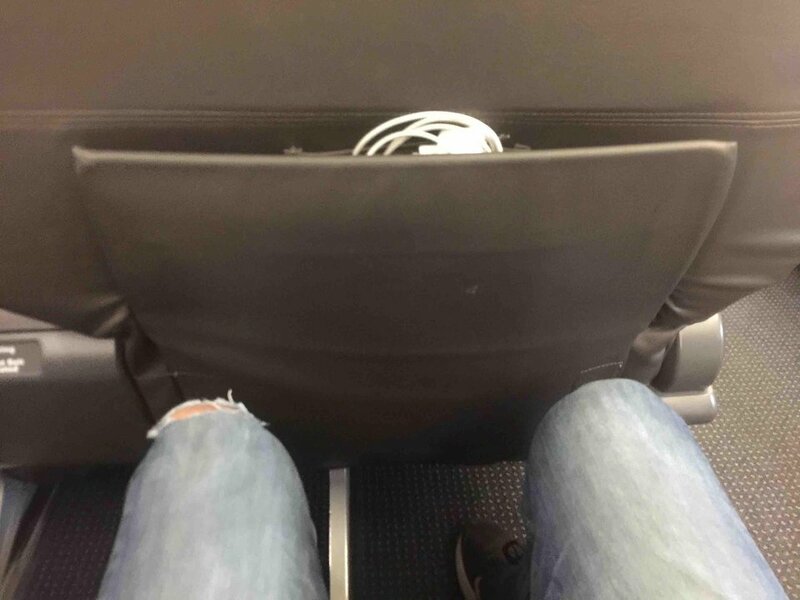 Poor leg room, even worse than a regular seat as you can not stretch (I'm 6'2). Has plenty of knee room though. Sold as a Main Cabin Extra seat, but not worth the money. I flew 12/8/15 from PHX to DEN. 10A was well worth the nominal upgrade cost. I did not find it colder near the exit door and did not find the narrower seat (due to the tray table in the armrest) to be an issue. The flight attendant agreed that it's one of the best seats on the aircraft. You can stow an item under the window seat in the row in front of you. The only real complaint is that the Airbus 320 & 321 are very noisey when the thrust reverers are used on landing. The overhead bins rattle unlike anything I've heard on any other aircraft. There is no in-flight entertainment system unless you use your own device/laptop and pay for access to films shown on the plane's wifi. There are also no powers plugs. This is acceptable for short flights but not great for longer flights (e.g., my 5 hour flight from JFK to PHX). Plenty of leg room but seats are more than "a bit" narrower because of the tray table in the arm rest. Big guys and plus size women would not be happy sitting more than a couple of hours in this seat. Very confining. 9D and 9E both recline. There is space under the seats ahead, though you need to stand up to reach them and they may be used by the flight attendants. Can get cold near exit door during flight and people tend to want to stand in the space which can be annoying. With the fixed arm rests, this would uncomfortable for a larger person. Smaller overhead bin available above but can't fit rollers (oxygen bottle mounted takes up space). Seat is narrower than usual fixed-armrest. If you want exit row choose 22E instead - no window seat and regular armrest. I flew on this aircraft on 11/7/15. It is an older aircraft, formerly an older US Airways. This seat was fine, however upholstery was aged and in poor shape. American Airlines flies 3 versions of Airbus A321.